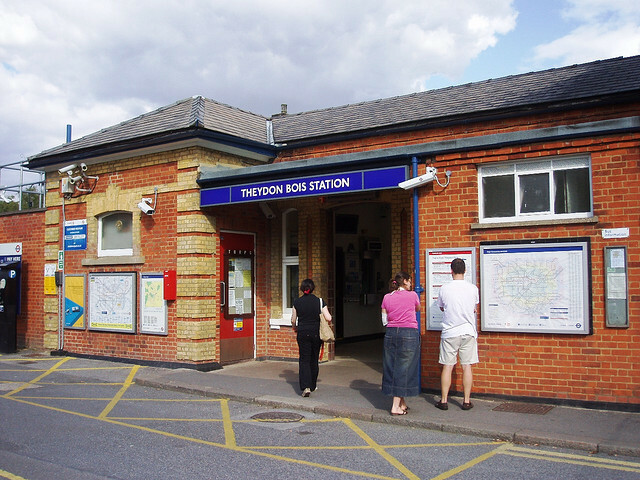 How Do You Pronounce Theydon Bois? M@ How Do You Pronounce Theydon Bois? Image by Ewan-M under Creative Commons. We've all heard it. "Can you tell me where Lie-sester Square is?". English place names can be a bit of a challenge to the outsider. 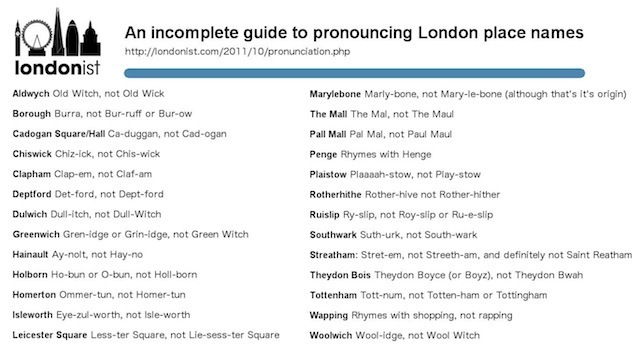 Even longtime Londoners might struggle with some pronunciations. Hands up who's contemplated the correct way to say 'Theydon Bois'? Leicester Square: Any native knows this is pronounced 'Less-ter', but that complex run of vowels commonly stumps visitors. Theydon Bois: A bit of a teaser, even for locals. The consensus seems to be 'Theydon Boyce' (or Boyz), given credence by Tube stop announcements. But we've found several reports of bus drivers pronouncing it as Theydon Boy. Most definitely, it's not Theydon Bwahh. Hainault: On the Central Line, it seems that pronouncing words the French way is passé. A few stops round from Theydon Bois, we find Hainault, which is enunciated as Hay-nolt rather than the Gallic 'ay-no. Cadogan Square/Hall: The Cadogan name is all over the Sloane Square area, named after a Georgian noble whose family still own much of the land thereabouts. It should be pronounced as Ca-duggan, not Cad-ogan. Holborn: A perennial puzzler, Holborn is best pronounced using as few letters as possible – o'b'n rather than Hole-born. Ho-bun is probably the commonest form among locals. Marylebone: As with Holborn, using fewer letters gets you nearer to the local pronunciation (up to a point). Mar'l'bun is a good start. Marry-lebone seems commonplace. Mary-le-bone is the tourist's choice, and close to the historical roots in St Mary-le-Bourne church. Homerton: The Simpsons fans might be tempted towards Homer-tun, but the correct form is more like Hommer-tun. The Mall: Potentially confusing for North American visitors, who may be expecting a shopping centre. The 'a' is short, making the word rhyme with 'pal'. And, as it happens, the name was borrowed from the neighbouring Pall Mall (definitely not pronounced Paul Maul), which itself was called after a croquet-like game called Pell Mell. Rotherhithe: This had never struck us as particularly tricky, until one (anonymous) Londonist contributor admitted: "This probably marks me out as a moron, but I was convinced Rotherhithe was pronounced Rotherhither when I first moved to London. If we were in Germany, I'd totally have been right." Greenwich/Southwark/Woolwich/Chiswick: The 'silent W' is a common peril for non-natives. The phenomenon tends to crop up in names of Anglo Saxon origin. If you see a W in the middle of a place name, just ignore it (hence Gren-itch, suth-urk, Wool-itch and Chis-ick). It's only a rule of thumb, though. Don't try it with Holloway or Queensway. Tottenham: Most Londoners probably say something like Tott-num. The name was most famously mangled by former Spurs midfielder Osvaldo 'Ossie' Ardiles, who rolled it out to 'Tottingham' in this top-10 hit from Chas & Dave. Here's a graphic you can pass around to any visitors who might need help. The following have all been added post-publication following reader comments (thanks). Deptford: The case of the silent 'p'. Simply, 'Det-ford'. Thanks to Gaz in the comments for the suggestion. Penge: @emdobinson on Twitter asks about this one. It rhymes with 'henge'. Ruislip: 20th Century London advises us that this should be pronounced 'Rye-slip'. Struggling with other places? Share in the comments below.